Happy Easter! I hope you all are having a great weekend! Today is another rare weekend post. I wore this outfit friday night and I love how laid back and comfortable the whole look was. I love this sweater so much from Sanctuary Clothing and of course my favorite boyfriend jeans again! I am not kidding when I say I wear these multiple times per week. That sweater is gorgeous! Love your necklace! beautiful spring look! love your necklace! Love the color of that sweater! Great look for a casual day. You look so beautiful! Gorgeous bag and sweater! I love this outfit! Those shoes are so cute and spring perfect! I love the Combo blue&yellow! i love your side braids!! you have such great taste! Love the blue & yellow together, in fact I'm wearing blue & yellow today! Such a bright & cheery combo. 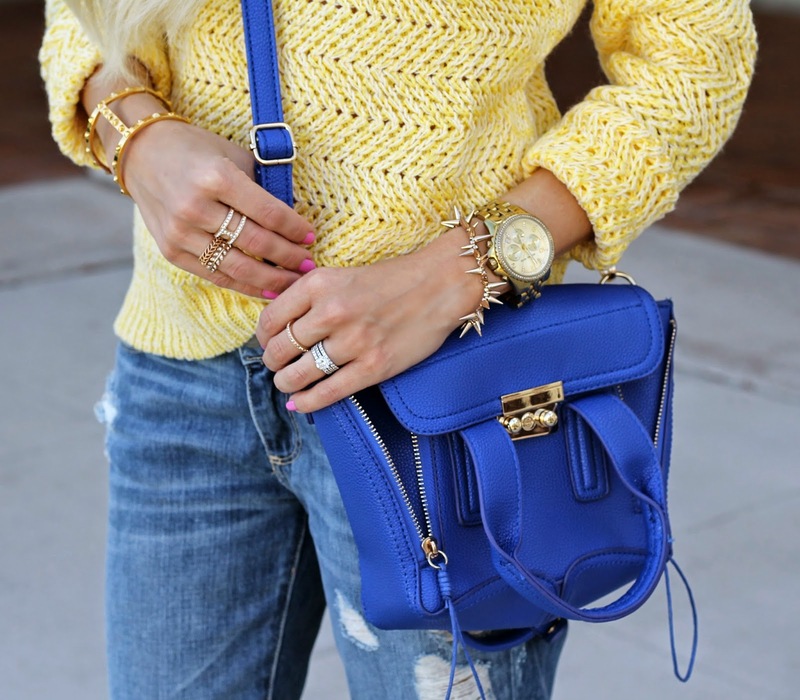 I love the blue and yellow combo! Great look!